Alor Setar is one of the gateways to Langkawi Island. To go from Alor Setar to Langkawi, you can take the ferry at Kuala Kedah Jetty. ETS train to Alor Setar is probably the most preferred way of travelling for those who are going to Langkawi. ETS train is faster and more comfortable compared to bus and cheaper than a flight. Besides, the location of Alor Setar Airport is far away from the city centre and the only way to go to Kuala Kedah Jetty is by taxi. Meanwhile, he train station is in the city centre, located closer to the jetty and you can go to the jetty by local bus or taxi. Besides going to Langkawi, locals and tourists also take ETS train to Alor Setar to visit the city. As the capital state of Kedah, Alor Setar also has its own attractions and charms waiting to be explored. There are many cultural and historical sites to visit such as State Art Galery, Paddy Museum and Wat Nikrodharam. You can also check out Pekan Rabu in Ukir Mall if you are looking for local delicacies. Alor Setar is a popular gateway to Langkawi so the tickets for ETS train to Alor Setar can be sold out quickly especially on high season. • ETS Platinum – have the least stops, taking slightly shorter time. Complimentary snacks are served on-board. Alor Setar Train Station or Alor Setar Railway Station is located not far from the city centre. You can take a metered taxi to go to your next destination from Alor Setar train station. If you are planning to go to Kuala Kedah Jetty to catch a ferry to Langkawi, easiest way is by taxi too. Alternatively, you can take a local bus. Local bus in Alor Setar runs by HBR Group of Companies. If you are on budget and do not mind walking a bit, local bus is a much cheaper option to go to Kuala Kedah Jetty. You can take local bus nearby the Kedah Regional Development Authority (Lembaga Kemajuan Wilayah Kedah) building. The bus stop is located within 10-15 minutes walking distance from Alor Setar Train Station. Tell the driver where you are heading and the bus should drop you off on the main road in front of the Kuala Kedah Jetty. The trip to Kuala Kedah Jetty should take around 20-30 minutes depends on the traffic condition. 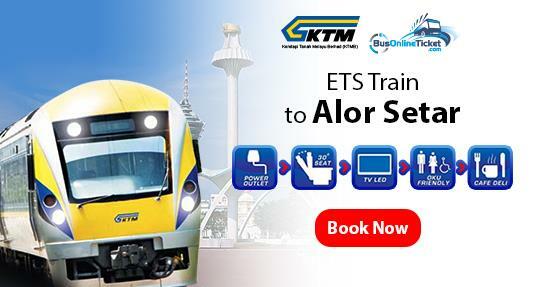 Easily Book Your ETS Online Ticket to Alor Setar Now!